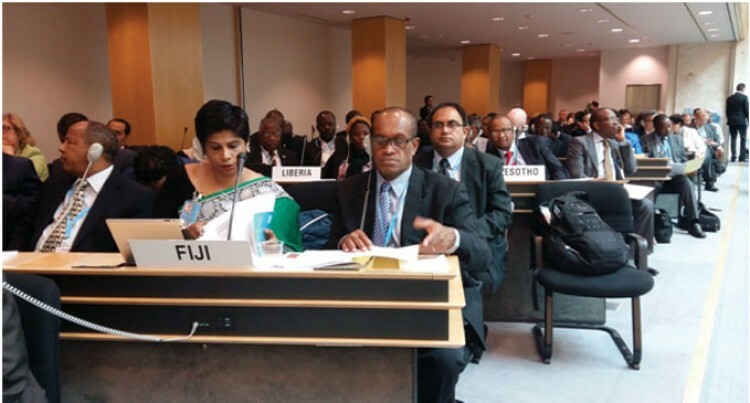 The Minister for Mealth and Medical Services Jone Usamate (front right), with Fiji’s Permanent Representative to the United Nations Nazhat Shameem (front left), and Dr Eric Rafaai (sitting at the back). The Director-General of the World Health Organisation closed the 68th World Health Assembly, noting the passing of several “land mark resolutions and decisions”. The meeting was attended by the Minister for Health and Medical service, Jone Usamate. He was accompanied by the Deputy Secretary for Public Health, Dr Eric Rafaai. Their attendance was supported by the Permanent Representative to the United Nations in Geneva and the Ambassador to Switzerland, Nazhat Shameem. 4. Member states agreed to a set of indicators to monitor progress for global nutrition targets in 2012 when the WHA endorsed a comprehensive plan on maternal, infant and young children. They agreed for most member countries to begin reporting on the indicators from 2016. There were other resolutions on the health impact of air pollution, epilepsy and global strategy and plan of action on public health, innovation and intellectual property rights. The assembly occurs annually in May at the Palais des Nations in Geneva, generally attended by health ministers from all 194 member countries. Mr Usamate will travel to Korea next to sign an MOU with the Ministry of Health there. This will be followed by visits to partner institutions based in Korea.